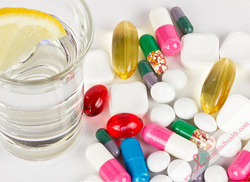 Hey all, many of you have have found great improvements in your health once your thyroid medications were optimized. But many of you struggle with getting your doctors to prescribe alternatives to Synthroid like Armour, Naturethroid or compounded meds. This is because the nation’s endocrinologists are warned against the use of T4/T3 medications by the American Association of Clinical Endocrinologists (AACE). Don’t have time to do this now? Select ‘share’ to save to your timeline for later viewing. — at Professional Village Compounding Pharmacy & Medical Supplies Sacramento . This entry was posted in health and tagged Armour Thyroid, Compounding Pharmacy sacramento, Hashimoto's thyroiditis, T4/T3, thyroid by Professional Village Compounding Pharmacy Sacramento. Bookmark the permalink.